This holiday it struck me how many bargain cookery books I have. There are more than two shelves full of those £3 Borders reduced paperbacks which specialise in cuisine from a certain country or continent. They look cheap, they feel cheap, heck, they ARE cheap, but I find these little books very useful. I’d love to be able to go out and spend £25 each time I fancied trying out something new but sadly, if I did that, I probaby couldn’t afford the ingredients I needed to make good use of the books I bought. Still, a book entitled “The Best Ever Curry Cookbook” isn’t likely to fill you with confidence about its contents but, rather suprisingly, it turned out to be quite informative and inspiring. Most of the book focuses on cuisine from the Indian subcontinent but around a third of it is devoted to curries from Thailand, Burma, Malaysia, the Phillipines and Indonesia. There are several very unusual recipes in this section of the book which I’m determined to try. 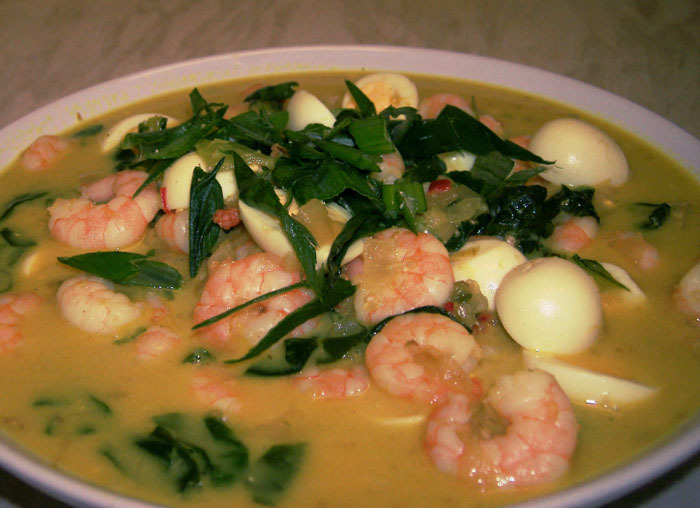 The first on my list was the prawn and quail egg curry. This was a really delicious meal. The flavour of the curry is delicate but earthy, dominated by garlic, ginger and turmeric with subtle heat (which could be increased if desired) and the lemongrass coming through right at the end. The sauce is thin, almost like a broth, which made it a nuisance to carry to the table but was wonderful mixed up with the rice. It pays to go easy on the fish sauce as its pungent flavour could easily overpower the other ingredients. A note on the use of stock here: As far as I’m aware most ‘wet’ curries don’t traditionally call for stock and instead get their flavour from the meat being braised slowly. For this reason I assume the use of chicken stock in this meal is not authentic. However, I find the right stock can be really useful in making ‘quick cook’ curries like this one. I’d use a light fresh stock that isn’t flavoured with herbs. I always make stocks like these from the carcasses from my roast dinners because they are so wonderfully versatile. I have come around to the idea of egg in curry. As a child, there was nothing more I hated than finding half an egg in an overpoweringly hot and salty Sri Lankan dish but the quail eggs suit the delicacy of flavours here. 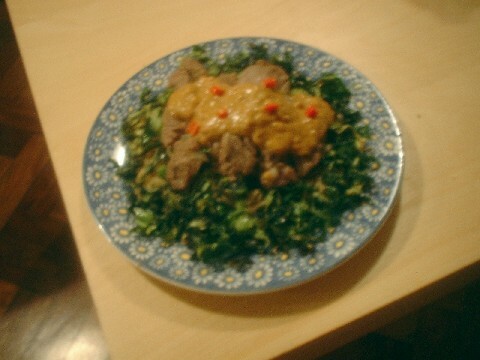 This is definitely a meal I will make again, especially since it is quick enough for a schoolnight dinner! 1 small stalk lemongrass, tough outer layer removed, trimmed and shredded. Sweat the onions, garlic and ginger together gently until the onions are soft but not coloured. Add the chilies, shrimp paste/fish sauce and lemongrass. Fry for a minute so they release their favours. Add the strained coconut milk, stock and sugar and stir well. Bring the mixture to a gentle bubble. Let the mixture reduce by about 40%. 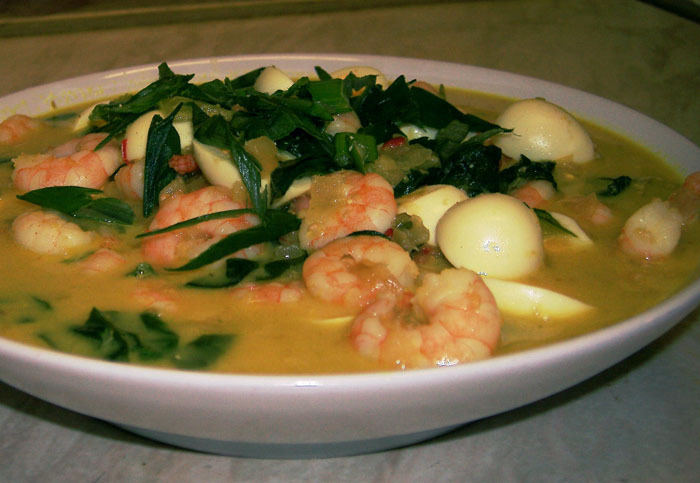 Stir in the prawns and leaves and turn the heat down so the curry is at a simmer. Stir gently until the prawns have just turned pink all the way through. This should ony take a few minutes and the leaves should also wilt in this time. Stir in the quail eggs. Turn the curry out into a serving bowl and sprinkle over the shredded spring onion. 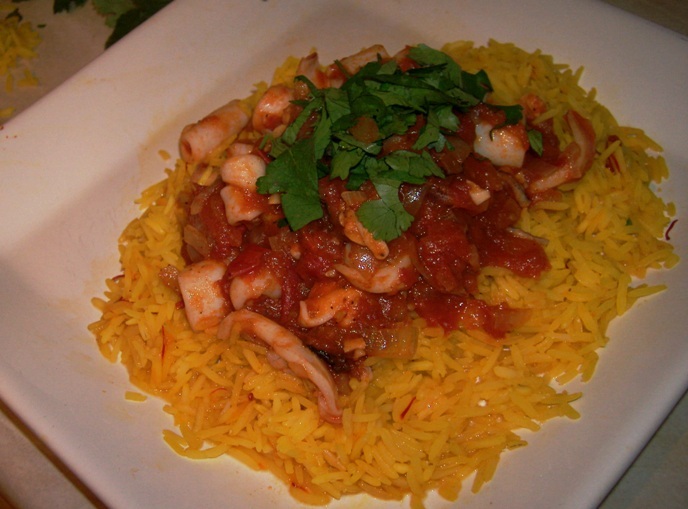 Serve immediately with plain boiled basmati rice.